En octubre del 2017, la gente de más 10 países de América Latina y el Caribe filmó su rutina de trabajo. Desde la madrugada hasta el anochecer, se nos revela un mosaico de dificultades cotidianas, aspiraciones y sueños. Countries differ dramatically in their ability to generate the work-related competences young people need to succeed in the labor market. Central European, Anglo-Saxon, and several Asian countries perform better with respect to many youth outcomes. Recent reforms are reducing cross-country institutional differences; the worst performing countries are learning from the best. Education systems that integrate more with the labor market, through apprenticeship, job placement services, or direct hiring by firms, seem to setup their youth for success in the labor market. 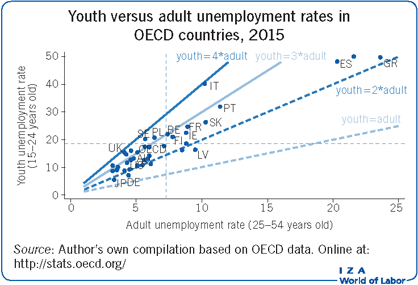 In most countries, the ratio of youth to adult unemployment is between two and three; in eastern and southern Europe, young people fare even worse. Southern and eastern European countries were the hardest hit by the global financial crisis, with youth suffering most. Temporary work does not solve the youth disadvantage; it helps only the most skilled workers and those in need of general, not job-specific skills. In a time of ever increasing educational attainment levels, young people still experience lower employment, income, and participation rates as well as higher unemployment compared to adults. The share of high school and tertiary graduates who accept jobs suited for lower education levels (skills mismatch) is high in many countries. The reason is the low level of work-related competences held by young people. Generating these competences should become a top priority for modern education systems. In addition, labor markets should be more flexible to allow earlier labor market entrance, though they should be wary of becoming over-reliant on the use of temporary contracts. Young people, in nearly every country, experience worse labor market outcomes than adults. However, there are striking differences across countries, with some performing much better than others. The reason behind the worldwide youth disadvantage can be traced back to their lower than average human capital. This may be because some youth drop out of school before achieving at least compulsory education, or because when they do achieve a high secondary or tertiary education level, they miss other key components of human capital, namely general and job-specific work experience. General competences can be acquired through any type of (even short) work experience. However, job-specific competences can be acquired and used only in specific jobs and require long periods of time to accumulate, say several years, depending on the actual professional content of the job. This low level of human capital among young people correlates with, among other things, jobs mismatch, which is the difference between the competences supplied by young people and those that firms require from them. Youth face a variety of challenges in different countries’ labor markets. In which countries do young people perform relatively better or worse in the labor market? Answering this question can provide important insights into the factors that lead to the success or failure of a country’s school-to-work transition (SWT) system. SWT regimes comprise all institutions that impact the education-to-work transition, including the education and training system, labor market regulations, the organization of the welfare state, and family structures. All these factors can have important implications for labor market outcomes of young people. A noteworthy study defines a transition system as “the relatively enduring features of a country’s institutional and structural arrangements which shape transition processes and outcomes” . The youth disadvantage in a given labor market can be assessed using different indicators. The most common is the unemployment rate, namely the share of the workforce that is actively seeking work. Nonetheless, especially in the case of young people, the unemployment rate tells only part of the story. An alternative is to look at the ratio of youth to adult unemployment rates. The former is affected more by the fluctuations of the business cycle than the latter, which more closely mirrors a country’s institutional characteristics and the functionality of its SWT system. OECD countries tend to cluster around similar values of the youth and adult unemployment rates and, hence, also the ratio of the two. The evolution over time of these rates is likewise similar within given groups of countries. Such evolutions are mostly independent of economic conditions and compositional differences in young people’s educational and social backgrounds . This suggests that several countries belong to the same SWT regime. Following a study from 2015, at least five different SWT regimes can be identified : (i) the north European or Scandinavian model (Finland, Norway, and Sweden); (ii) the continental European model (Austria, France, Germany, and the Netherlands, as well as—in some opinions—Belgium and Denmark); (iii) the Anglo-Saxon model (the UK, the US, Australia, Canada, Ireland, and New Zealand); (iv) the south European model (Greece, Italy, Portugal, and Spain); and (v) that of former socialist countries, which include the new EU member states. These SWT regimes overlap with the identification of welfare state regimes—social democratic, conservative, liberal—with the addition of the so-called Latin Rim (southern European countries) , and former socialist countries. Other indicators, such as the employment rate, the rate of inactivity, and the not in education, employment, or training (NEET) rate, are also useful to catch specific aspects of young people’s labor market behavior, but the first two mentioned—the youth unemployment rate and the ratio of the youth to the adult unemployment rate—are the most commonly used. As shown in the Illustration, young people experience a disadvantage compared to adults in every OECD country. In most countries, the youth unemployment rate is two to three times larger than for adults. Germany and Japan are the only two countries in which young people have nearly the same risk of unemployment as adults. These two countries have experienced the lowest relative disadvantage of young to adult people in their labor markets for decades . 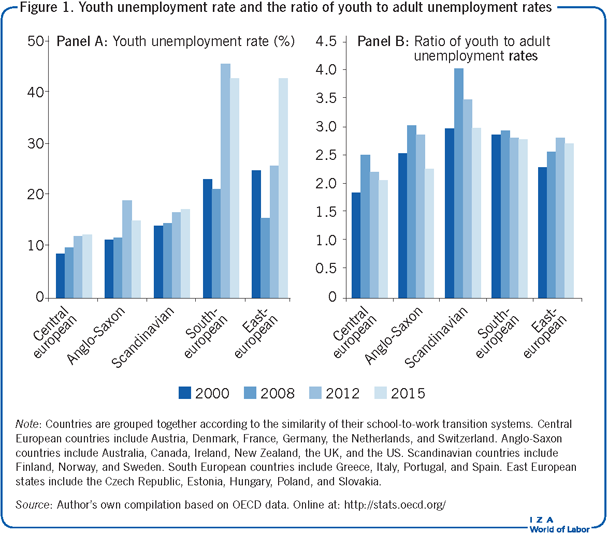 In Anglo-Saxon countries (the US, the UK, and Australia, among others), both youth and adults have a relatively low unemployment rate, though the youth rate still exceeds that of adults. More generally, there is considerable cross-country variation when it comes to youth’s labor market success. For instance, many central European countries (especially Germany, Austria, and Switzerland), Anglo-Saxon ones, and some Asian countries (especially Japan) have lower youth unemployment and inactivity rates, and higher employment rates and earnings than the rest of the EU—especially southern and eastern Europe as well as, to a lesser extent, the Scandinavian countries. This comparison also holds true for a number of Latin American, Central Asian, and African countries. Important differences have emerged in terms of how young people in different countries have faced the recent global financial crisis. Figure 1 compares groups of countries with similar SWT institutions from 2000 to 2015. The two panels show the youth unemployment rate and the ratio of youth to adult unemployment rates, respectively. The youth unemployment rate (shown in Panel A) has increased during this period in each group of countries. The 2007 financial crisis had a particularly strong impact in the Anglo-Saxon, eastern European, and, above all, the southern European countries. The reason for this vulnerability is probably the greater degree of labor market flexibility in these groups of countries. It should be noted that labor flexibility impacts the entire workforce in Anglo-Saxon countries, but only new hires in the eastern and southern European countries. In these latter two groups, labor flexibility has been achieved only recently through the so-called two-tier reforms, which generally only affect new entrants into the labor market, without changing the contracts of the majority of the existing workforce. These reforms essentially make it more convenient for firms to hire workers on temporary contracts. Temporary contracts, in turn, are the first to be discontinued during economic crises, simply because the easiest way for management to reduce staff numbers is by not renewing temporary contracts upon their natural expiration date. Thanks to this marked increase in temporary contracts, firms find it much easier to apply the so-called last in, first out (LIFO) principle, usually at the expense of young people in particular. According to this principle, when necessary, managers tend to fire the most recently hired workers first, which reduces both the loss of human capital for the firm as well as the overall social cost to society, since the youngest workforce is the easiest to relocate and is often unmarried and/or has no children. Nonetheless, the post-crisis recovery is well underway in the Anglo-Saxon and eastern European countries, whereas youth unemployment remains extremely high in southern European countries. A persistent slow growth has played a significant role in keeping youth unemployment high in this last group of countries. Figure 1, Panel B looks at the ratio of youth to adult unemployment rates. Each group, with the exception of the southern European countries, saw an increase in this ratio in the aftermath of the financial crisis. The reason that the ratio in southern European countries does not appear to have been affected is because the crisis has been so deep and prolonged in that region that it has also impacted the adults to a much larger extent than elsewhere; indeed, the fact that adults have been affected so significantly is often seen as an indicator of the depth of the crisis in these countries . By 2015, the Anglo-Saxon countries had returned to their pre-crisis ratio levels or even below. This is likely related to the fact that both firing and hiring are easier than in the other country groups. Another typical aspect of youth behavior is that they tend to seek jobs in a haphazard and discontinuous way. They are particularly affected by news about the labor market outlook and tend to get more easily discouraged than other demographic groups when the average unemployment rate is high. Since many young people are not actively seeking work, they tend to be classified more often as inactive rather than unemployed, but, in fact, they are still seeking a job. To take this behavior into account, many observers suggest looking at youth’s inactivity rate as well as their unemployment rate. In addition to these two metrics, the NEET rate offers another statistical indicator that is able to account for young people’s tendency to be discouraged in their job search. NEET accounts for the tendency of young people to move more frequently between different labor market statuses, including education and training. Being in education and/or training should not be considered as a negative state for young people, since their main aim should be to build their own human capital. Moreover, in recent times, young people are increasingly involved in insecure, very-short-term labor market experiences, especially in those countries where labor flexibility has been achieved by liberalizing temporary work arrangements. In fact, in most countries, but especially in southern and eastern Europe, many young people are hired on short fixed-term contracts. This trend has led to calls for labor market reforms aimed at introducing a single type of permanent labor contract, which would entail less employment protection and lower litigation costs, and be achieved through the definition of pre-defined severance pay as well as lower fiscal and social security costs than are currently associated with fixed-term contracts . The Italian Jobs Act of 2015 is one reform that moves in this direction. Last, but not least, another commonly observed fact is that youth labor markets around the world are segmented. Some young people, especially those coming from rich families, tend to experience a smooth SWT. They achieve the highest educational level they wish and soon after find the jobs best suited for them. On the other hand, there are segments of young people who remain at a constant disadvantage in the labor market. This primarily includes low-educated young people, especially those without compulsory educational attainment and those who come from a poor background. Why do young people experience a disadvantage in the labor market? A mix of factors should be considered when attempting to answer this question. First and foremost among these is the lack of sufficient economic growth in many countries. The youth disadvantage is strongly and inversely affected by the business cycle: when an economy is expanding, its youth unemployment rate decreases more than the average, while it increases more than average when an economy is contracting. A study from 2012 supports this, by showing that the youth unemployment rate is particularly sensitive to economic and financial crises . A mix of factors explain this counter-cyclical nature. First, the aforementioned LIFO principle plays a role, as it disproportionately impacts young workers. Second, the LIFO principle is amplified by policies that reduce the cost of firing, either for all workers, as in the Anglo-Saxon countries, or primarily for young workers, as is the case in countries that have implemented two-tier reforms that only apply to the new hires, such as most south and east European countries. If the majority of new hires are made through temporary contracts, it is easy to discontinue such contracts by simply not renewing them. This leads to a situation in which many youth cycle rapidly in and out of employment. In addition to macroeconomic factors, one should consider more structural factors. In fact, differences in the youth disadvantage across countries are stubbornly persistent, and this is typically explained by different institutional settings. Structural factors are directly affected by the way in which SWT systems are organized and, indirectly, depend on policies regarding the education system and employment protection legislation. These institutions affect the length and degree of smoothness of youth’s SWT, and are so important in terms of labor market outcomes because they affect the main difference between youth and adults, namely the lack of two of the three main components of human capital: general and job-related competences. Human capital is not only based on education, but also on these components, which generate what has been called the “experience gap of young people” . This gap is the main reason firms prefer adults to young people. Therefore, the gap generates what is sometimes called the “experience trap”: firms need not only general competences in their employees, which are gained through education, but also work-related competences and skills, which can be gained only through work experience. While general competences and work experience are gained quite quickly in any type of job and are easily transferred to any other type of job, job-specific competences and specific work experience can only be gained and used in the specific job for which they apply. Moreover, these specific traits require a long period of time to acquire. Examples of general competences acquired through any kind of work experience (e.g. a short time working at a fast-food restaurant) are: timeliness, ability to deal with the fact that in any organization there is a hierarchical and social division of labor, ability to deal with customers, and ability to use a word processing program. Examples of job-specific work experience are: teaching pupils for a teacher or professor, preparing a summons for a barrister, or preparing a tax return for a financial advisor. Both general and job-related competences are subject to market failure. One study dating from the 1960s showed that it is not convenient for firms to provide general training because the competences acquired can be easily transferred to a competitor when workers change jobs . Consequently, firms will tend to transfer the cost of training to workers via lower wages, unless the state offers financial or practical training support. Likewise, job-specific competences tend to generate market failures and thereby require intervention from the state to be fully developed. As these competences are acquired through long periods of work experience, job-specific training is unlikely to be provided to workers on temporary contracts. Neither workers nor firms have sufficient incentives to invest in this form of training when contracts are temporary. It is therefore not uncommon that workers wishing to start a liberal profession, for instance, will find it hard to receive the necessary training from firms. One way to overcome this problem is by means of long-term contracts and wage structures that increase with job tenure to make workers more faithful to their employer . Temporary work can be a tool to provide general but not firm-specific human capital. Due to their lower cost to firms, temporary contracts could incentivize them to provide on-the-job training to build general human capital, because workers will pay the cost of training via lower than market wages. Conversely, employers will be willing to provide on-the-job training to build firm-specific human capital in employees under the condition that the employee remains at the firm long enough to fully return the firm’s investment. Toward this end, firms tend to offer increasing wages to their employees for the exact purpose of incentivizing them to remain with the firm for this sufficiently long period of time. Lower wage costs, which are attached to fixed-term (temporary) contracts, might be sufficient to allow young people to acquire the training that they need to overcome their gap in general, but not their gap in job-specific human capital. In other words, while temporary contracts may incentivize employers to hire young people, thereby imparting them with general skills, these arrangements will not lead to the development of job-specific competences. This is because firms worry that they will not benefit from the returns to job-specific competences that young workers would acquire if given job-specific training while under temporary contracts. The state plays a critical role in helping young people acquire all three of the key components of human capital. However, the way in which such help is provided differs dramatically across countries and the mix of institutions involved is highly complex; hence, it is important to identify different regimes or models used in different countries. SWT systems differ on whether it is the mission of the education system itself to provide work-related competences (as in dual education systems) or whether young people are expected to acquire these competences after completing their education (as in sequential education systems) . With their flexible labor markets, Anglo-Saxon countries provide the best example of sequential education systems, in which young people are able to acquire their work-related competences directly through work. If the labor market is sufficiently flexible, young people are able to move from one job to the next in a relatively quick and easy way, which allows them to gain a variety of work-related competences fairly quickly. To understand the importance of labor flexibility to reduce the experience gap of young people, consider a simple example. In the US, the annual job finding rate is above 60%, which means that 60 out of every 100 unemployed people find a job within the year, and, hence, if chances are equally distributed among unemployed individuals, every unemployed person has, on average, a chance to find a job in less than two years, which is a relatively short period of time. Another important feature of Anglo-Saxon countries is their aversion to nationwide wage-setting mechanisms. Such practices tend to equalize wages across age groups, forcing firms to pay equal wages for different human capital and skill levels. In the absence of these nationwide policies, the ability to pay lower entry wages for young people incentivizes firms to hire them. With its apprenticeship system involving about 60% of any young cohort, Germany is the best example of a dual education system. In Germany, the majority of young people acquire work-related competences during school, through their apprenticeship contract. Professional universities are also provided for graduates from the apprenticeship system. The main limitations of the German approach are to be found in the excessively specific knowledge of workers, which could be an obstacle in periods of dramatic structural change. Additionally, students are subject to early tracking, in which they are obliged to choose at the age of ten between going to a Gymnasium (a type of school with a strong emphasis on academic learning, which qualifies students for university) or other school types (which would qualify students for an apprenticeship). At this age, individuals have not fully developed their individual preferences; therefore adults usually make the choice instead . Other types of SWT systems are more cumbersome (e.g. the Scandinavian model) or disorganized (e.g. the southern European model) in how they build work-related competences. Scandinavian countries include only small aspects of the dual principle in work-related learning at school in combination with rigid labor markets. These countries tend to help young people gain work-related competences by means of active labor market policies, implemented on a large scale and provided to everybody who has not found a job within four months of the beginning of their unemployment spell or completion of education. This is called the Youth Guarantee and has been recently extended by the EU to all EU countries. Last, but not least, the southern European SWT, which is similar to that found in many Latin countries all over the world, also tends to include some aspects of the dual principle and quite rigid labor markets. For example, in Italy, in the early 1990s before the recent labor reforms, the job finding rate was only about 13%, which means that 13 out of 100 unemployed job seekers found a job within a year of their unemployment spell’s start. This meant that, on average, an unemployment spell was likely to last just less than eight years, which is obviously a very long duration. Only after the recent reforms (started in the late 1990s and still ongoing) has the job finding rate increased to about 30%, but this only applies to new hires. Only since the start of the 2010s have educational reforms introduced work-related learning into students’ curricula and the state adopted some proactive labor market measures similar to those found in the central European and Scandinavian systems. The most important limitation in the context of youth labor market performance is the tendency of labor economists to overrate the importance of labor markets and employment protection legislation. Labor flexibility and labor market institutions more generally are only some of the factors that affect the development of human capital among youth. Another important factor, which has only recently been understood as crucial, is the role of educational policy and well-designed educational reforms. Additionally, the strong emphasis on economic growth, which is typical of the Keynesian approach, is often exaggerated by economists. Of course, economic growth is an obvious pre-condition to increase employment, especially among young people, but some aspects of the youth-specific challenges are independent of the business cycle and the degree of labor market flexibility. Instead, they depend on the way in which SWT systems are structured and, in particular, on the way education systems are built. More information should be collected on how the structure of an education system affects youth labor market issues, rather than the current focus on the role of employment protection legislation. How much do countries spend on education? How interlinked are education systems with the labor market? How flexible are education systems and how many limitations are imposed on young people preventing them from fully developing their talent? All these questions should be addressed to get a better understanding about the mechanisms and reasons for differences in youth unemployment. Young people are the most affected by adverse economic conditions. One of the main reasons for this is that firms prefer to fire the most recently hired workers when layoffs are called for. They do this for both social and economic reasons: young people have fewer family commitments, which allows them to transition into new work situations more easily, and they possess less firm-specific human capital, thereby minimizing the firm’s losses when laying off employees. Structural and institutional factors also matter. Young people are becoming ever more educated around the world, but they still have lower human capital than adults because they lack work-related competences. These competences can only be acquired on the job, through general and job-specific work experience. This experience gap generates an experience trap as employers search for employees who already possess competences, but young people need work experience to acquire them. SWT regimes differ across countries in how they address this youth human capital gap. Anglo-Saxon countries utilize high-quality education and flexible labor markets. Central European countries, especially Germany, employ the dual principle of education (apprenticeship). Scandinavian countries have a sequential education system like the Anglo-Saxon countries, but rigid labor markets; they prevent long-term unemployment by providing proactive schemes on a large scale. Meanwhile, eastern and southern European countries are still trying to reform their institutions to come in line with these other systems. In sum, if the youth disadvantage indeed depends on a human capital gap, then it is not by chance that the countries with the lowest youth disadvantage have education systems that are more integrated with the labor market and a modern system of “flexicurity” at work. Flexicurity means not only flexibility, but also labor security, which implies that if not job stability, then at least employment and income stability should be provided by means of passive income support, while proactive training schemes increase employability. From the point of view of young people, it should now be clear that a well-designed education system is important to have efficient flexicurity. While each country must address their own unique challenges, these features do appear key in providing youth with the tools they need to succeed in the labor market. The author thanks two anonymous referees and the IZA World of Labor editors for many helpful suggestions on earlier drafts. Previous work of the author contains a larger number of background references for the material presented here and has been used intensively in all major parts of this article . The author has received no financial, material, or personal source of support for his research. This article was amended on 22 January 2018 to clarify the categories of unemployed counted in the Sheffield Hallam research. Es de suma importancia conocer el Código de Trabajo, le presentamos los 7 artículos que creemos que todos deberían conocer. ¿Qué es el Código de Trabajo y cuál es su función? ¿Por qué debo saber la importancia del código de trabajo? Muchas son los guatemaltecos que se cuestionan la relevancia de tener conocimiento del código de trabajo. Este código estructurado permite establecer la importancia que: toda persona que labora posee derechos y deberes; por lo tanto, el patrono debe regirse bajo este marco legal y propiciar un ambiente adecuado para el desenvolvimiento de los trabajadores. El código de trabajo contiene normas especiales que determinan las clases de contratos para los trabajadores de la empresa privada o gobierno. Este documento legal estable los roles entre los Gerentes o Representantes frente al personal que tiene bajo su mando. Pero ¿Quién regula este código? Para el cumplimiento de éstas normas, el ente regulador es el Ministerio de Trabajo y Prevención Social de Guatemala que vela por el buen desempeño de las relaciones empleado-empleador, personal-patrón u obrero-patronales, con el fin de establecer leyes que procuren mantener un equilibrio y respeto entre los dos agentes involucrados. Además, El Código de Trabajo de Guatemala tiene el fin de contribuir a la paz social, a fomentar la productividad y el desarrollo social. El Código de Trabajo es el encargado de establecer las normas para el desarrollo de la persona que labora, y abarca todo tipo de especialidades profesionales y oficios riesgos de trabajo y enfermedades. Sucede con gran frecuencia el desconocimiento por parte de los guatemaltecos acerca de los beneficios y nivel de protección que brinda el código de trabajo. Cuando ocurriere el fallecimiento del cónyuge o de la persona con la cual estuviese unida de hecho el trabajador, o de los padres o hijos, tres días. Cuando el empleador autorice expresamente otros permisos o licencias y haya indicado que estos serán también retribuidos. Para responder a citaciones judiciales por el tiempo que tome la comparecencia y siempre que no exceda de medio día dentro de la jurisdicción y un día fuera del departamento de que se trate. Por desempeño de una función sindical, siempre que esta se limite a los miembros del Comité Ejecutivo y no exceda de seis días en el mismo mes calendario, para cada uno de ellos. En todos los demás casos específicamente previstos en el convenio o pacto colectivo de condiciones de trabajo. Además de vacaciones y asuetos, todo trabajador tiene derecho a disfrutar de un día de descanso remunerado después de cada semana de trabajo. La semana se computará de cinco a seis días según costumbre en la empresa o centro de trabajo. — Artículo 126. ¿Puedo cambiar mis vacaciones por dinero? De acuerdo con el artículo 133: ‘Las vacaciones no son compensables en dinero, salvo cuando el trabajador que haya adquirido el derecho a gozarlas no las haya disfrutado por cesar en su trabajo cualquiera que sea la causa. Se prohíbe al trabajador prestar sus servicios a cualquier persona durante el período de vacaciones’. ¿A qué tengo derecho si estoy embarazada? Según el artículo 152 del Código de Trabajo: ‘La madre trabajadora gozará de un descanso retribuido con el ciento por ciento (100%) de su salario durante los treinta (30) días que precedan al parto y los cincuenta y cuatro (54) días siguientes’. Los días que no pueda disfrutar antes del parto, se le acumularán para ser disfrutados en la etapa post-parto, de tal manera que la madre trabajadora goce de ochenta y cuatro (84) días efectivos de descanso durante ese período. El artículo 116 expresa: La jornada ordinaria de trabajo efectivo diurno (06:00 — 18:00 horas) no puede ser mayor de 8 horas diarias, ni exceder de un total de 48 horas a la semana. La jornada ordinaria de trabajo efectivo nocturno (18:00 — 06:00 horas) no puede ser mayor de 6 horas diarias, ni exceder de un total de 36 horas a la semana. En dos horas diarias y en doce horas a la semana para los jóvenes que tengan esa edad o menos, siempre que el trabajo de estos se autorice por la Inspección General de Trabajo. ¿Cuáles son razones justas de despido? Cuando el trabajador deje de asistir al trabajo sin permiso del patrono o sin causa justificada, durante dos días laborales completos y consecutivos o durante seis medios días laborales en un mismo mes calendario. Cuando el trabajador revele los secretos técnicos, comerciales o de fabricación de los productos. Cuando el trabajador sufra la pena de arresto mayor o se le imponga prisión correccional por sentencia ejecutoriada. Cuando el trabajador incurra en cualquier otra falta grave a las obligaciones que le imponga el contrato. ¿Qué lleva un reglamento interior de trabajo? La designación de las personas del establecimiento ante quienes deben presentarse las peticiones de mejoramiento o reclamos en general y la manera de formular unas y otros. Crear una bolsa de empleo e inversión para salvadoreños en EE.UU. con competencias y habilidades específicas, y facilitar una una línea de financiamiento especial para quienes regresen al país es parte de lo que propone el sector privado. Ante el impacto económico que se espera tendrá en El Salvador y también en los demás países del Triángulo Norte, la cancelación del estatus temporal de trabajo de aproximadamente 195 mil salvadoreños que hoy residen en EE.UU, el sector empresarial propone algunas alternativas para comenzar a solucionar los problemas que irán surgiendo a partir de septiembre de 2019. El inadecuado manejo de la política exterior del gobierno del FMLN, ha sido un claro factor que ha influido de manera determinante en la cancelación del TPS, que beneficiaba a cerca de 200 mil salvadoreños en Estados Unidos y a sus familias acá en El Salvador. La terca insistencia del gobierno del FMLN de alabar constantemente a los gobiernos fracasados y dictatoriales de Cuba y Venezuela, en adición a su histórica postura “anti-imperalismo yanqui”, es decir anti-Estados Unidos, ha incido entre otros factores, la decisión del gobierno de Estados Unidos. Prueba de ello es que a Honduras sí se le ha dado una prórroga para estudiar la situación. Las consignas antiestadounidenses y la persistente quema de banderas en actos oficiales del FMLN, fue el la gota que rebalsó el vaso. “No permitiremos que se irrespete nuestra bandera” ha expresado tajantemente el Presidente Trump, sin embargo, los salvadoreños podemos convertir lo que podría ser una grave crisis humanitaria, en una oportunidad si hacemos las cosas bien y de manera proactiva. 1. La creación de una bolsa de trabajo e inversión en un sitio web orientando a salvadoreños en Estados Unidos con competencias y habilidades específicas a fin de que puedan conectar con empresarios en el país, ya sea para ser contratados o para inversiones conjuntas. Estamos conscientes que miles de salvadoreños han triunfado en Estados Unidos como emprendedores en un medio difícil tanto por las diferencias culturales como por el idioma, el talento de nuestros compatriotas podría perfectamente ser aprovechado para generar mayor inversión y empleo. 2. La creación por parte del sistema financiero de una línea de crédito con condiciones especiales para los emprendedores salvadoreños que regresen al país, tal apalancamiento financiero servirá para apoyar la creación de nuevos emprendimientos que podrían redundar no solo en la absorción productiva de los salvadoreños que regresan sino también en la generación de nuevas empresas y empleos en el país. 3. La realización de un foro nacional multidisciplinario del cual salgan propuestas concretas tendientes a mejorar el clima de negocios y la elaboración de propuestas sectoriales con el propósito de estimular la inversión privada nacional y atraer inversión extranjera a fin de aumentar el empleo. Estamos claros que las anteriores propuestas solo pueden ser exitosas con un gobierno que comprenda a cabalidad la importancia de tener buenas relaciones con nuestros principales socios comerciales y el papel fundamental de la empresa privada para generar empleo, prosperidad y desarrollo constante.